Continuing on with our narrative from the book Hindu Temples: What Happened to Them by authors Shourie, Narain, Dubashi, Swarup and Ram Goel, today we look at a small selection of the thousands of Hindu temples destroyed in India by the invading Muslims. In the context of this book, the term "Hindu" is used to represent a broad range of schools which the authors classify as being under the umbrella of sanatana-dharma: Vaishnavism, Saivism, Shaktism, Buddhism, and Jainism. While Gaudiya Vaisnavas understand that the actual definition of sanatana-dharma is not a classification of religious or philosophical systems, we can appreciate the simple fact that a rain of destruction was brought down on the heads of countless non-Muslim devotees, temples and deities, and a good many of these were under the shelter of one of the four main Vaisnava sampradayas. The brief list of destroyed temples that follows, along with the narrative from Hindu Temples, illustrates the historical record that exists of temple ruins left by the Muslims. 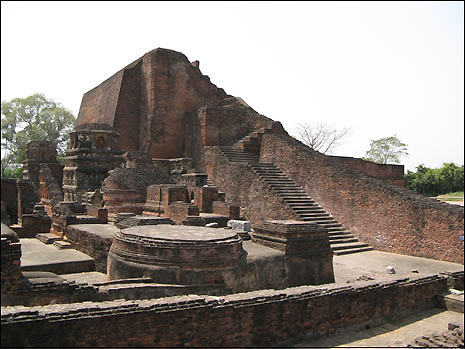 In a future segment we'll get into a more specific study of the ruins that were truly Vaisnava, not "Hindu", but first we'll consider the long survey of temples destroyed in various parts of the country. "The men and women and children who were killed or captured or converted by force cannot be recalled for standing witnesses to what was done to them by the heroes of Islam. The apologists for Islam - the most dogged among them are some Hindu historians and politicians - have easily got away with the plea that Muslim "court scribes" had succumbed to poetic exaggeration in order to please their pious patrons. Their case is weakened when they cite the same sources in support of their owns speculation or when the question is asked as to why the patrons needed stories of bloodshed and wanton destruction for feeding their piety. But they have taken in their stride these doubts and questions as well. There are, however, witnesses who are not beyond recall and who can confirm that the "court scribes" were not at all foisting fables on their readers. These are the hundreds of thousands of sculptural and architectural fragments which stand arrayed in museums and drawing rooms all over the world, or which are waiting to be picked up by public and private collectors, or which stare at us from numerous Muslim monuments. These are the thousands of Hindu temples and monasteries which either stand on the surface in a state of ruination or lie buried under the earth waiting for being brought to light by the archaeologist's spade. These are the thousands of Muslim edifices, sacred as well as secular, which occupy the sites of Hindu temples and monasteries and/or which have been constructed from materials of those monuments. All these witnesses carry unimpeachable evidence of the violence that was done to them, deliberately and by human hands. So far no one has cared to make these witnesses speak and relate the story of how they got ruined, demolished, dislocated, dismembered, defaced, mutilated and burnt. Recent writers on Hindu architecture and sculpture-their tribe is multiplying fast, mostly for commercial reasons-ignore the ghastly wounds which these witnesses show on the very first sight, and dwell on the beauties of the limbs that have survived or escaped injury. Many a time they have to resort to their imagination for supplying what should have been there but is missing. All they seem to care for is building their own reputations as historians of Hindu art. If one draws their attention to the mutilations and disfigurements suffered by the subjects under study, one is met with a stunned silence or denounced downright as a Hindu chauvinist out to raise "demons from the past" with the deliberate intention of causing "communal strife." "At Tordi there are two fine and massively built stone baolis or step wells known as the Chaur and Khari Baoris. They appear to be old Hindu structures repaired or rebuilt by Muhammadans, probably in the early or middle part of the 15th century… In the construction of the (Khari) Baori Hindu images have been built in, noticeable amongst them being an image of Kuber on the right flanking wall of the large flight of steps…"
"At Naraina… is an old pillared mosque, nine bays long and four bays deep, constructed out of old Hindu temples and standing on the east of the Gauri Shankar tank… The mosque appears to have been built when Mujahid Khan, son of Shams Khan, took possession of Naraina in 840 A.H. or 1436 A.D… To the immediate north of the mosque is the three-arched gateway called Tripolia which is also constructed with materials from old Hindu temples…"
"At Chatsu there is a Muhammadan tomb erected on the eastern embankment of the Golerava tank. The tomb which is known as Gurg Ali Shah's chhatri is built out of the spoils of Hindu buildings… On the inside of the twelve-sided frieze of the chhatri is a long Persian inscription in verse, but worn out in several places. The inscription does not mention the name of any important personage known to history and all that can be made out with certainty is that the saint Gurg Ali (wolf of Ali) died a martyr on the first of Ramzan in 979 A.H. corresponding to Thursday, the 17th January, 1572 A.D."
"The oldest and the best known building at Gaur and Pandua is the Adina Masjid at Pandua built by Sikandar Shah, the son of Ilyas Shah. The date of its inscription may be read as either 776 or 770, which corresponds with 1374 or 1369 A.D… The materials employed consisted largely of the spoils of Hindu temples and many of the carvings from the temples have been used as facings of doors, arches and pillars…"
"The Rajbari mound at the South-east corner is one of the highest mounds at Bangarh and. must contain some important remains. The Dargah of Sultan Pir is a Muhammadan shrine built on the site of an old Hindu temple of which four granite pillars… are still standing in the centre of the enclosure, the door jambs having been used in the construction of the gateway. "The Dargah of Shah Ata on the north bank of the Dhal-dighi tank is another building built on the ruins of an older Hindu or Buddhist structure… The female figure on the lintels of the doorway now, fixed in the east wall of the Dargah appears to be Tara, from which it would appear that the temple destroyed was Buddhist…"
"The eastern portion of the tomb was formerly a mandapa of an earlier Krishna temple which stood on the same spot and sculptures on the inner walls represent scenes from the Ramayana and the Mahabharata, with descriptive titles inscribed in proto-Bengali characters… The other frieze… shows Vishnu with Lakshmi and Sarasvati in the centre, with two attendants, and five avataras of Vishnu on both flanks… Further clearance work has been executed during the year 1932-33 and among the sculptures discovered in that year are twelve figures of the Sun God, again in the 12th century style and evidently reused by the masons when the Hindu temple was converted into a Muslim structure…"
"The date of the construction of the Hindola Mahall cannot be fixed with exactitude… There can, however, be no doubt that it is one of the earliest of the Muhammadan buildings in Mandu. From its outward appearance there is no sign of Hindu workmanship but the repairs, that have been going on for the past one year, have brought to light a very large number of stones used in the structure, which appear, to have been taken from some pre-existing Hindu temple. The facing stones, which have been most accurately and smoothly cut on their outer surfaces, bear in very many cases on their inner sides the under faced images of Hindu gods, or patterns of purely Hindu design, while pieces of Hindu carving and broken parts of images are found indiscriminately mixed with the rubble, of which the core of the walls is made." "…The mosque itself appears from local tradition and from the numerous indications and inscriptions found within it to have been built on the site of, and to a large extent out of materials taken from, a Hindu Temple, known to the inhabitants as Raja Bhoja's school. The inference was derived sometime back from the existence of a Sanskrit alphabet and some Sanskrit grammatical forms inscribed in serpentine diagrams on two of the pillar bases in the large prayer chamber and from certain Sanskrit inscriptions on the black stone slabs imbedded in the floor of the prayer chamber, and on the reverse face of the side walls of the mihrab. 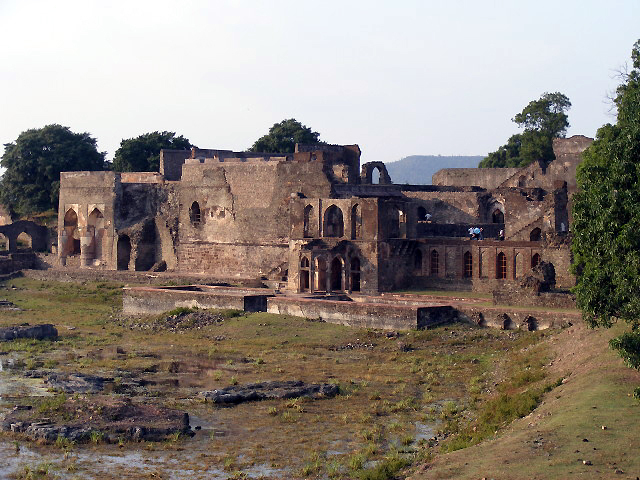 "The Lat Masjid built in A.D. 1405, by Dilawar Khan, the founder of the Muhammadan kingdom of Malva… is of considerable interest not only on account of the Iron Lat which lies outside it… but also because it is a good specimen of the use made by the Muhammadan conquerors of the materials of the Hindu temples which they destroyed…"
"The most important temple at Vijayanagar from an architectural point of view, is the Vithalaswamin temple. It stands in the eastern limits of the ruins, near the bank of the Tungabhadra river, and shows in its later structures the extreme limit in floral magnificence to which the Dravidian style advanced… This building had evidently attracted the special attention of the Muhammadan invaders in their efforts to destroy the buildings of the city, of which this was no doubt one of the most important, for though many of the other temples show traces of the action of fire, in none of them are the effects so marked as in this. Its massive construction, however, resisted all the efforts that were made to bring it down and the only visible results of their iconoclastic fury are the cracked beams and pillars, some of the later being so flaked as to make one marvel that they are yet able to bear the immense weight of the stone entablature and roof above…"
"No ancient Hindu or Jain buildings have survived at Bijapur and the only evidence of their former existence is supplied by two or three mosques, viz., Mosque No. 294, situated in the compound of the Collector's bungalow, Krimud-d-din Mosque and a third and smaller mosque on the way to the Mangoli Gate, which are all adaptations or re-erections of materials obtained from temples. These mosques are the earliest Muhammadan structures and one of them, i.e., the one constructed by Karimud-d-din, must according to a Persian and Nagari inscription engraved upon its pillars, have been erected in the year 1402 Saka (A.D. 1324), soon after Malik Kafur's conquest of the. Deccan." "Three stone lintels bearing bas-reliefs were discovered in, course of the clearance at the second gateway of the Hill Fort to the north of the Bhutnath tank at Badami… These originally belonged to a temple which is now in ruins and were re-used at a later period in the construction of the plinth of guardroom on the fort… The bas-reliefs represent scenes from the early life of Krishna and may be compared with similar ones in the Badami Caves…"